Well the guys are all out and doing well on tour! Sav is closing in on the final days with his group and have had a great tour. They had an excellent Kaikoura pelagic, finding a large trawler which had over 100 albatross behind it, with six species of albatross present! Skipper Gazza of course giving the group a great time! Next day they found a black stilt at the Ashley Rivermouth – this mega endemic is sometimes but not always found here, and certainly takes the pressure off the last few days in the MacKenzie Basin! Across on the West Coast a perched falcon was nice and then a great night out with Okarito Kiwi Tours, having a close encounter with one of the male kiwi, and having him call just 2m away an incredible experience. Kea in the bag in a couple of locations also. One the way to Wanaka a forest patch had the group hear and glimpse maybe 10 yellowhead, but finally good views for everyone, so another key endemic seen well. Of course rock wren can often be tricky, but these guys were in luck and the next day had views of three, possibly four, capped off by an adult and three fully grown blue duck nearby! Stewart Island was great as always, although a little unusual on Ulva with lots of yellowhead and brown creeper but South Island saddleback only heard – lucky they had already seen them in the Marlborough Sounds! A Fiordland crested penguin was a very welcome find! Meanwhile, Neil has finished with his group, but Phil is having a great time with his group. They shared the Hauraki Gulf pelagic with Neil and so that was a great start to their tour. Previous days had seen excellent fairy tern action, with a pair seen fishing and then feeding a fledged juvenile! Tiritiri Matangi was its usual brilliant self for Phil and his group, and then Miranda managed to pull everything out of the bag, with nice close wrybill as well as broad-billed, curlew, sharp-tailed and pectoral sandpiper! Heading to Pureora Forest Park the next day, found that it was still producing great results, with excellent long-tailed cuckoo, rifleman, yellow-crowned parakeet and kaka. 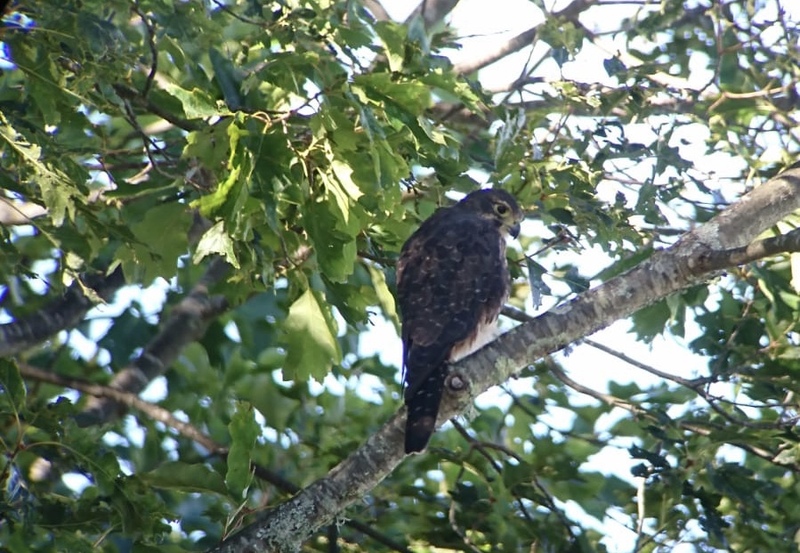 The next day around Turangi the group had awesome perched falcon – check out this photo taken by Phil with his phone through the scope! Perched juvenile falcon digi-scoped by Phil Hammond. Heading across to the South Island Phil and his group had 29 King shags in the Marlborough Sounds, with outstanding views of Hector’s dolphins right beside the boat – always a crowd pleaser! The great views of orange-fronted parakeet for everyone, and very close hoary-headed grebe in the afternoon. So all going great, and looking forward to more updates. Meanwhile, Matt Jones started with his group in Auckland on 29 January and Matt reports an excellent first day, with great gannet action, finding a pipit nest, and an excellent time watching the same pair of fairy terns that Phil and his group saw also feeding the juvenile! With such a tiny population of birds, the hope of this subspecies rests on this and one other juvenile produced this season! The evening was a roaring success with EIGHT North Island brown kiwi over the course of the night and excellent views for everyone! Amazing – what a way to start your New Zealand birding tour aye!? Next day saw the same pair of fairy terns with juvenile, some takahe to kick off the afternoon, as well as a morepork! Their Hauraki Gulf pelagic the next day saw excellent numbers of New Zealand storm-petrels, and all the other usual suspects, including about 40+ grey tern lets at the Mokohinau Islands! A small pod of short-beaked common dolphins was a nice treat for the group also. Next day out to Tiritiri Matangi, with all the usual sightings as well as a water bath full of takahe! Hot weather is bringing the birds to the water sources around the island, and this pic by Matt kind of says it all! 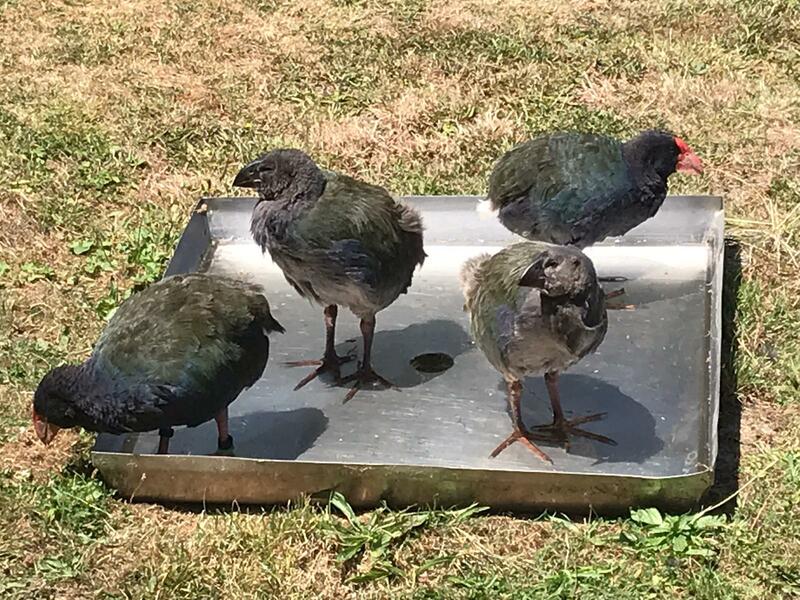 Mum, Dad, and the kids – the takahe on Tiritiri Matangi Island rehydrating after a warm day! Photo by Matt Jones.